Chicago is a great city for art. It’s big enough to have a range of good galleries in several locations, yet small enough to let you take in quite a lot in a short period. I hadn't been there in six years, and it was good to be back. 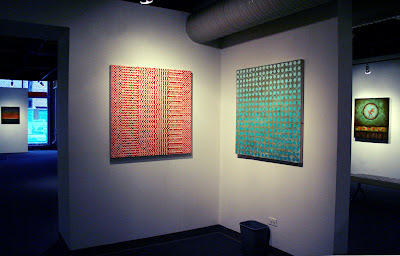 Two Openings, One Space . 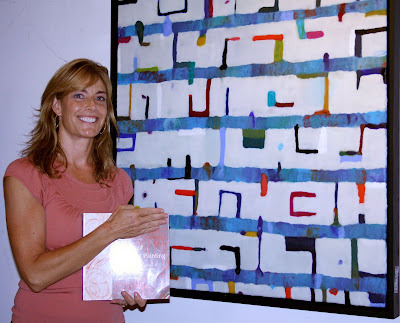 I flew in on Friday, September 7, to attend the opening of my good friend, Julie Karabenick, who was having a solo show. 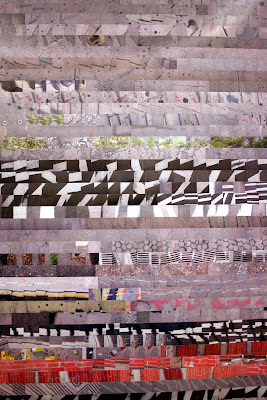 Julie is the founder and editor of Geoform, an online curatorial project, international in scope, focused on contemporary abstract geometric art. 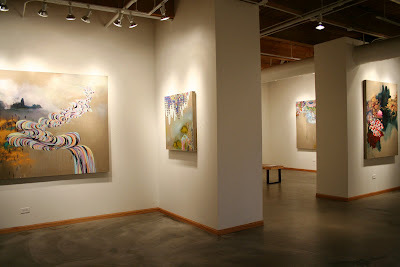 She is also a fine painter, and this was evident at her solo at Woman Made Gallery. 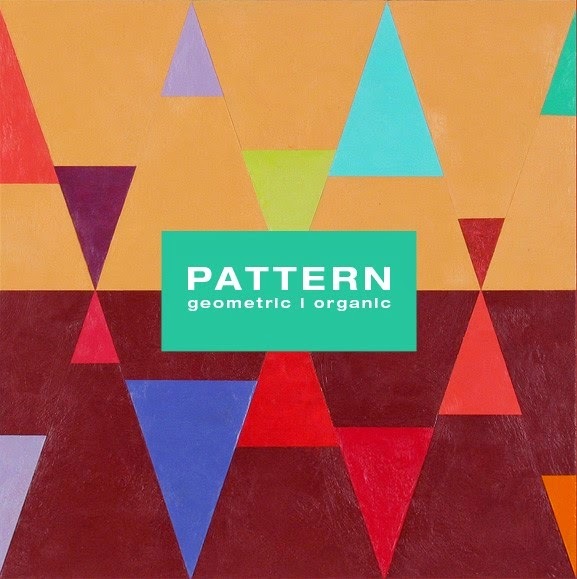 Julie's geometry is rigorously plotted and cleanly executed; it’s beautiful in its order, cerebrally and visually satisfying. The newest work is a breakthrough because it has all that and more: a greater sense of space, more intense color and, well, I guess emotion is the word I’d use. 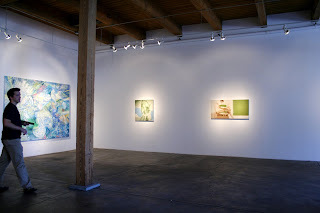 You’ve seen Julie's work on this blog before—recently, in fact, as I included her in Luxe, Calme et Volupte, my big, beautiful curatorial effort at Marcia Wood Gallery in Atlanta this past summer. 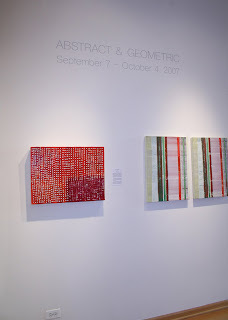 Given her expertise with geometric abstraction—a strong sense of its history as well as who’s working with this particular visual expression, Julie also juried a show, Abstract and Geometric, for the large upstairs gallery. Artists I’ve mentioned on these pages were included: Rose Olson; Diane Ayott; Reese Inman, who flew in from Boston (surprise! ); Kathleen Waterloo (more of whom shortly); and myself. 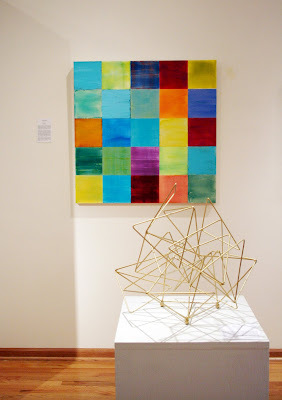 I also liked work by Eileen Goldenberg, Penelope Jones, Naomee Guest, Paola Merazzi and Lynda Ray. 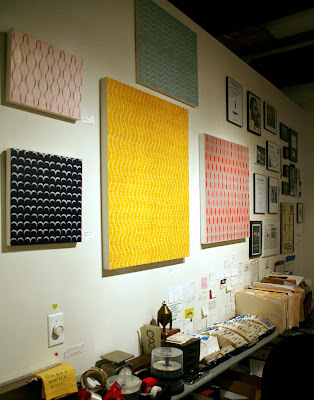 I don’t enter shows anymore, but this was a worthy project and a worthy gallery, so I broke my no-entry rule. The not-for-profit WomanMade, 15 years old last month, carries on a feminist tradition started by galleries such as A.I.R. in New York, giving women artists the opportunity to show and network, and giving younger artists the opportunity to interact with those a generation ahead who may function informally as mentors. 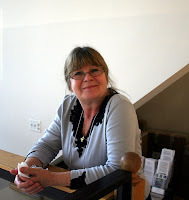 Beate Minkovski, the co-founder, executive director—and heart and soul— of the gallery, has surrounded herself with able and talented women. Spend some time on the gallery’s website. Better still, visit the gallery. 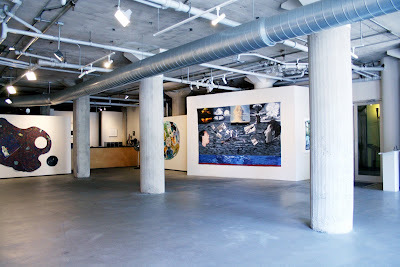 In the four hours between checking in at HoJo (not the Ritz, but the location, right in River North, was great) and getting to the Woman Made openings, I visited the nearby galleries ("river" being the Chicago River that meanders through town; "north" being its location in relation to the river). It’s half a dozen blocks chockablock with galleries. 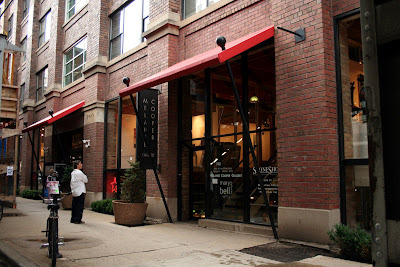 The main gallery street in this neighborhood is Superior, which, like the rung of a ladder, connects Wells and Franklin, two other streets with a strong gallery presence. 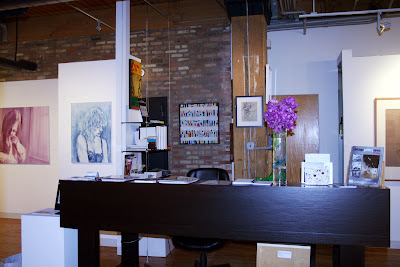 I can’t list everything—hey, I’m not Chicago Gallery News (if you're visiting the city, this is the publication to seek out, not Gallery Guide)--but I can take you from A to Z. 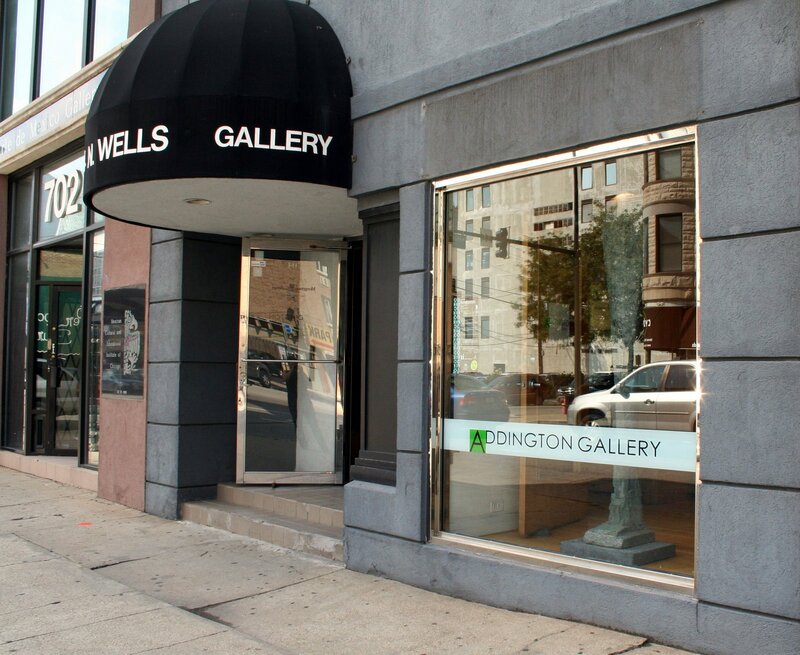 Its name newly shortened from Gwenda Jay/Addington, the Addington Gallery is now owned by Dan Addington, longtime dealer and himself a painter. 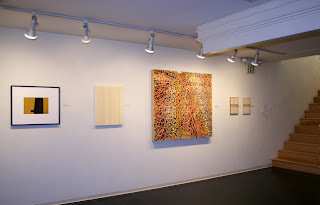 Howard Hersh had the solo show, and a number of other artists—including Amanda Crandall and Addington himself, had work up in the front gallery. 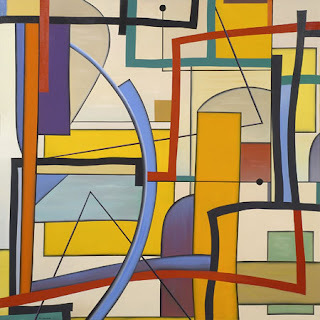 I’ve written about Howard before; his abstraction is of the geometric variety, with a palette of deep earth hues. Crandall does beautifully executed miniature landscapes, and Addington exhibits a kind of gothic romantic sensibility in his small paintings. 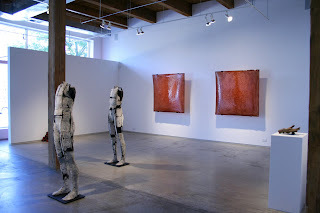 All three work in encaustic. 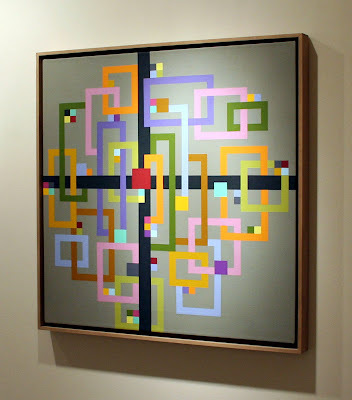 I particularly responded to the exquisitely patterned geometries in egg tempera by Rebecca Shore, which were hanging in the office and in the middle gallery. 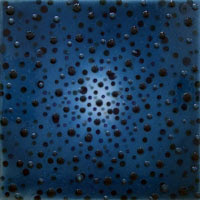 As you know, I respond to materials, to geometry and to pattern, so Shore’s work was something of a trifecta for me. "I love these," I exclaimed to no one in particular. "I do too," responded the gallery guy, who turned out to be Byron Roche himself. 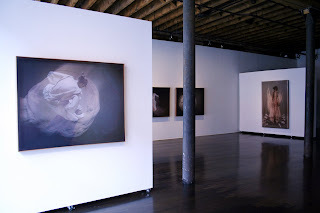 Here the materials were, well, materials: inkjet prints on tulle and canvas, more specifically tulle layered several inches above the canvas so that the double images created dimension and atmosphere. The photographer Gabriela Morawetz called her solo show "Egospheres," and approporately each work places the figure in its own little slightly dimensional world. I've known Melanee for several years and participated in two group shows with her. 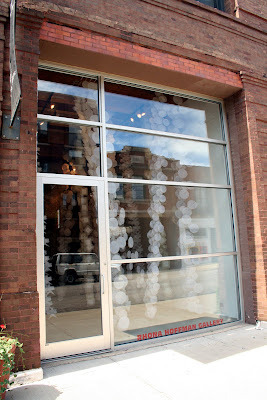 This was the first time I’d visited the gallery in its new location. It’s on Franklin, nestled under the El. My encaustic-involved readers will find a plethora of wax-based painting here: the geometries of Tracey Adams, Tremain Smith and Kathleen Waterloo, and the mixed-media landscapes of Miranda Lake. 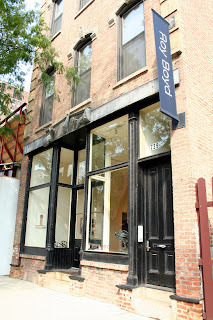 The New York outpost of this gallery had a short life, but the Chicago original is an anchor of the River North neighborhood. 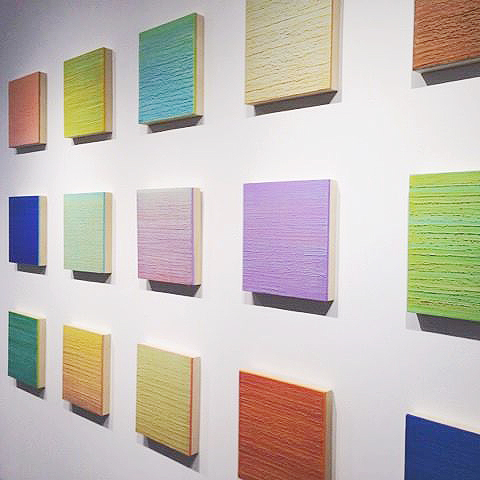 Perimeter Gallery is an elegant space with elegant work—elegant as in clean, precise, formal, reductive. 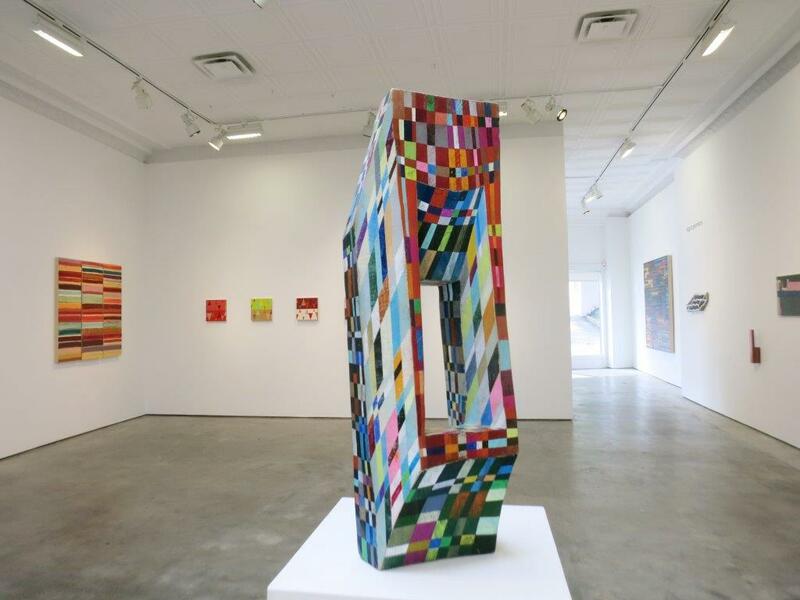 The solo show, "Constructions," contained reductive work with a strong material sensibility by Gordon Powell: wafer-thin layers of wood collaged (and framed) as if they were paper, or thicker pieces assemblaged into relief sculptures. 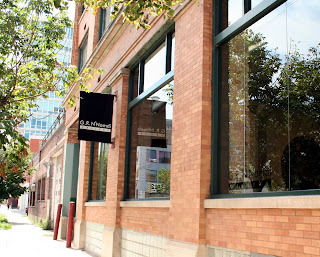 This gallery has the first floor and basement of its own three-story building. 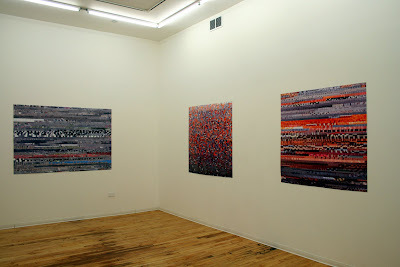 The main gallery was showing the work of Daniel Bodner, woozily atmospheric streetscapes of New York. But the draw for me was in the lower-level gallery where favorites like William Conger, Marcus Linenbrink and Jerome Powers were in a gallery-artist show. 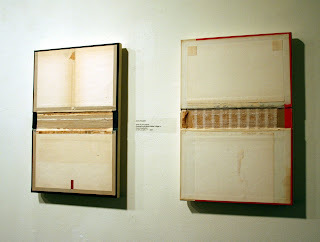 New to me: John Fraser's minimalist constructions, which on closer inspection turnedout to be deconstructed bookcovers. 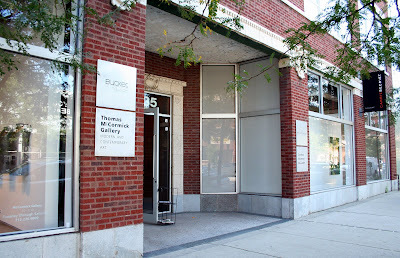 Ellen Lanyon, legendary Chicago artist was in this gallery when I was there. I don’t know her and we didn’t talk, so I’m just name dropping. 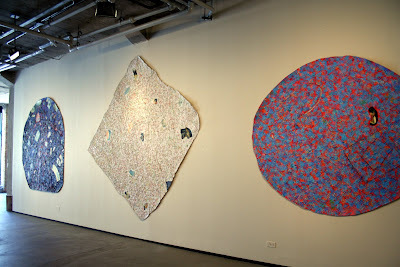 I can tell you that I LOVED the solo show there: Jackie Tileston’s "Adventures of the Semionauts." G.R. 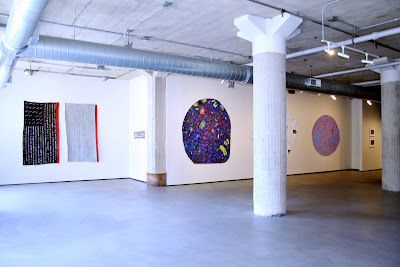 N'Namdi Gallery on Peoria, site of Howardena Pindell's solo show, "In My Lifetime"
From River North I took a taxi to the West Loop galleries, most of which I know through their presence at the art fairs, except for G.R. N’Namdi, which I know from its 26th Street outpost in Chelsea. It's always good to see Jumaane N’Namdi, the young director of the three G.R. 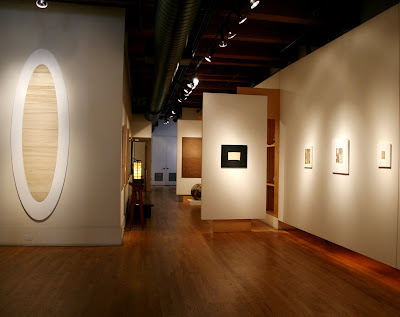 N’Namdi galleries in Chicago, Detroit and New York. 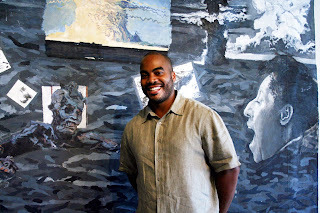 Not many dealers have had an entire life in art, but Jumaane came up under the tutelage of his father, George ( the natty guy in the porkpie hat, should you happen to run into him at an art fair) and he’s got a lifetime’s worth of stories about artists. (There’s a book there, Jumaane.) All three N’Namdi galleries show primarily established midcareer artists, many of them artists of color. 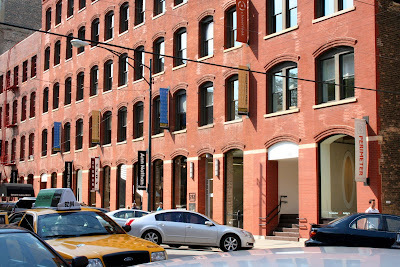 I’d been wanting to visit the Rhona Hoffman Gallery because I’d seen it only at the fairs. The gallery represents Mikalene Thomas, whose work I noted in my Miami coverage. 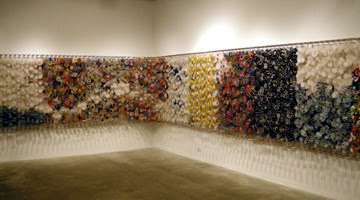 This show was by Jacob Hashimoto, an artist whose constructed paper installation fills the front gallery like a cumulus forest and whose multilayered installation of small, kite- or parasol-like shapes hugs the walls in the large central galleries. 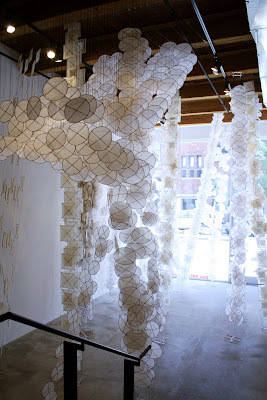 It’s a technical tour de force of glueing and tying, and a really beautiful installation. After I'd taken a few shots, I foolishly asked, “Do you mind if I take pictures?” I identified myself and my blog. The gallerina behind the desk said I couldn’t shoot. Well, that I should wait to get the permission of the gallery director who wasn’t there at the moment. The clock was ticking, so I spent some time looking and then left. 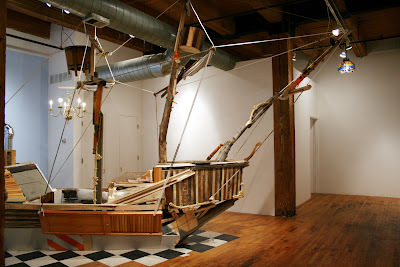 Fortunately I can show you the main-gallery installation courtesy of Paul Klein's e-mail Art Letter and give you a link, also courtesy of the same document, which shows a video of Hashimoto making the work. 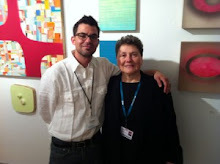 Paul Klein, in case you don't know, is the eminence grise of the Chicago gallery scene. 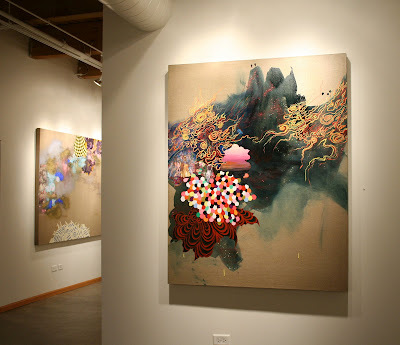 Since I don't get to Chicago often, I value his newsletter--informative, well-written, and hugely supportive of Chicago arts--as a way to stay in touch with a vibrant art scene. You can ask to be put on the subscriber list.
. At Thomas McCormick Gallery, “Ariadne’s Clew,” a solo show of body-centered sculpture by the Chicago-based Darrin Hallowell. 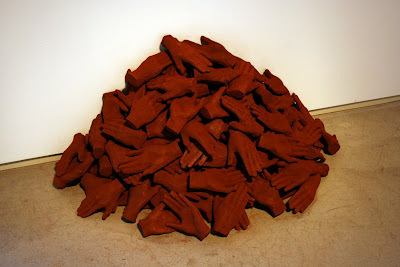 Once I got past my Auschwitz associations, I particularly responded to the casts of the artist's own hands piled into a small pyramid on the floor.
. Next door at Carrie Secrist Gallery, “Struck: Introducing New Painters” co-curated by Chicago artist Richard Hull.
. At Gallery 40000, “Where’s My Ship,” a sculpture installation by Nathan Redwood, a California-based painter. The installation took up the entire small space. It’s what what the Nina, Pinta or Santa Maria might have looked like if assembled by a boatbuilder with a wide independent streak--and maybe not too much knowledge of how to make something float. I started the previous post with Julie Karebenick. Let me end this one with her. After hopping a taxi back from the West Loop to River North, I met Julie and her husband Stuart for a late lunch. 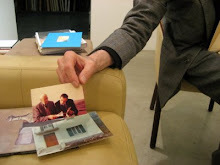 Julie had been interviewing Chicago legend William Conger for Geoform, with Stuart (a researcher and educator by profession) serving as photographer. We walked over to Karyns, a vegan restaurant on N. Wells, just across the street from Roy Boyd. Vegan was perfect for the three of us. Over Buddha Bowls (stirfried vegetables and brown rice) and a basket of deepfried cauliflower, zucchini and tofu, we sat and talked before I hopped a taxi for O’Hare. Tell you one thing: I’m going to tighten up my return schedule. Six years is too long between visits. This post comes under the category of "Sometimes You Just Have to Say Something." 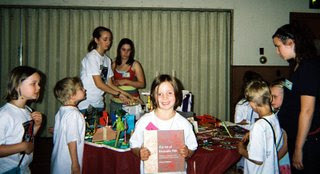 First let me show you some examples of work I made in 1995. 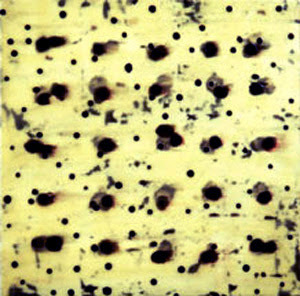 They're from Cera, a series of 40 small to midsize paintings that I showed in New York, Atlanta and Boston over the subsequent couple of years, images of which I posted on early versions of my website (1998-2000 or so). Now, check out these paintings. I'm not making a big deal about it or suggesting that this was anything but a coincidence--inspiration comes in all kinds of ways, after all--but after the sixth person noticed it and commented on the similarity between my paintings and this artist's (the e-mail I got today included a link and the message, "Do these paintings look familiar?") I thought I'd at least give my earlier paintings some visibility. 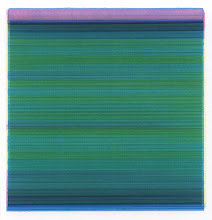 I'm not mentioning the artist's name or the gallery's website, because the point of this exercise is not to point fingers or piss off dealers; it's just to say: I did my series in 1995 and revisited it in 2001. I'm aware that someone is doing something very similar in 2007. If this artist wasn't aware of my work before, perhaps she will be now. I wonder if people will send her images of my work, just as they have been sending me images of hers. Recently a regional museum requested that I donate a small painting to their auction. I said no. 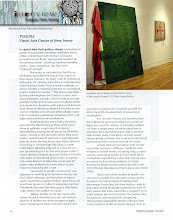 This museum has never shown the least interest in including my work in its thematic shows. 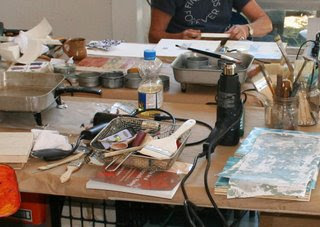 Its curators have never expressed sufficient interest in my work to make a studio visit. But they’d be happy to sell it to support their program, which to this date has not supported me. What’s wrong with this picture? Of course this is not the first time I have been asked to donate work to an auction. If you are an artist, you have been inundated with requests. They’re all good causes: support for museums and art centers, college scholarship programs, AIDS research, breast cancer research. If there’s a need or an illness, there’s an art auction. Here’s the problem: the people least able to afford to donate are the ones repeatedly being asked to give it up. And the ones most able to afford to buy artwork are getting it for a song. What’s wrong with that picture?
. "It’s great visibility," they tell you. Maybe. If you're an art student or an emerging artist and you pick your causes carefully, yes, you may get some visibility and attention. Some local dealers do look around for who and what’s hot at these events. A collector might acquire a piece at the beginning of your career and remain supportive as your career develops.
. Is there an illustrated catalog? Even midcareer artists might appreciate the boost of a full-page color image and a listing in the "Bibliography" section of your resume.
. Auctions are like Loehmans: they condition collectors to buy lower than retail. This means the rug is effectively pulled out from under your carefully cultivated prices. You’re cheapened.
. Auctions eliminate the dealer. Here’s how the art world works: Artists make the art. Dealers sell it. It’s a symbiotic relationship, because a dealer creates a market for your work, creates a collector base, places the work with private and corporate clients. Undercut the dealer and you undercut your own best interests.
. You get nothing. Zip. Zippo. 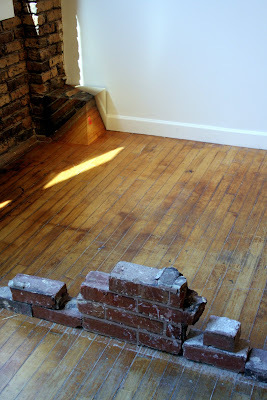 Nada.
. You can’t even deduct the cost of your work; you can deduct only the cost of materials.
. Think you can put these shows on your resume? Think again. What dealer wants to show an artist who is giving it away?
. And if the work doesn’t sell, you’re really screwed. Subtext: "This artist can’t even give it away."
. Ask for a percentage of the sale. Artist-friendly institutions understand that you can't keep giving it away. For emerging artists, it’s a good deal because you get some visibility and a small sum for your work.
. Give cash. Come tax time you can deduct the full price of the donation.
. Look at alternative auction ideas. 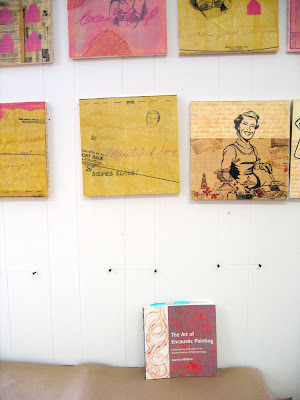 For instance, I enjoy participating in Postcards from the Edge, part of the Visual AIDS project, which is hosted by a different gallery each year, and Wish You Were Here, the postcard show to benefit A.I.R. 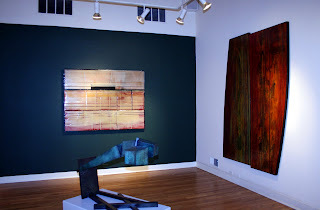 Gallery, both in New York. These events draw thousands of people. For each event, I produce a postcard-size painting that will sell for a standard price, about $50. ........No one signs their name on the front of the postcards, so you could be getting a Faith Ringgold or a Joanne Mattera or a Josephine Schmo. That’s part of the fun. And the price is equally accessible to both artists and collectors. You don’t undercut your price because the price is the same for everyone. 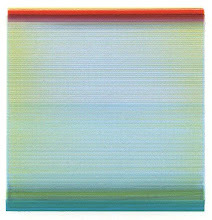 What’s more, I appreciate that these institutions understand and respect that they are asking artists to donate work, so they’ve devised a win/win situation.
. Make a high enough minimum so that we’re not cheapened by the sale price.
. Give the artist 50 percent of the selling price.
. Make a good printed catalog with one color image per page. Spell the artists' names correctly.
. Create a well-designed website with images of each artist's work. Spell the artists' names correctly.
. Give us the name of the person who purchases our work so that we can put her/him on our own mailing list.
. Give us a free ticket to the event, not just a ticket with a reduced price.
. Acknowledge our contribution by showing our work in your institutions--not just for the auction. Oh, and don’t ask too often. At the bottom of this post, I offered a new book to the person whose old book was most in need or replacement. 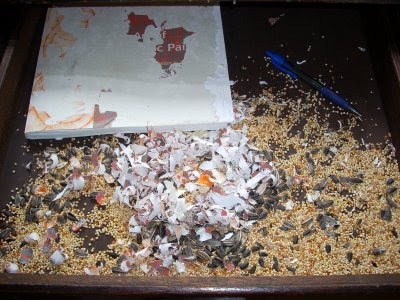 Turns out that the very first person to send in pictures, Camille Davidson of Maine--she of the mouse nest made from the book cover--had the best of the worst. 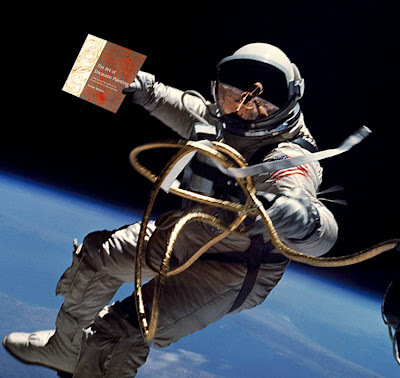 And thanks, everyone, for sending in your pictures, including from Mississippi, Milan, en masse, and outer space. 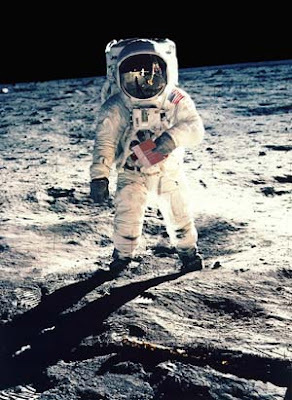 The Best Pictures on Earth--and Elsewhere! Rodney Thompson. Uh, small world. Hope they'll be back in time for the Conference in June. Meanwhile, on terra firma . . . 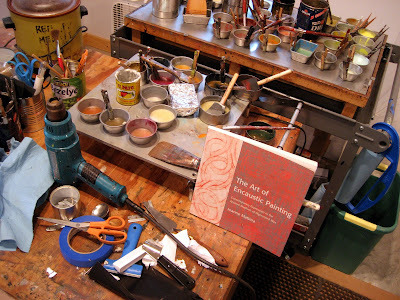 Here's what I wrote in August: My book, the Art of Encaustic Painting, will have its sixth anniversary next month. 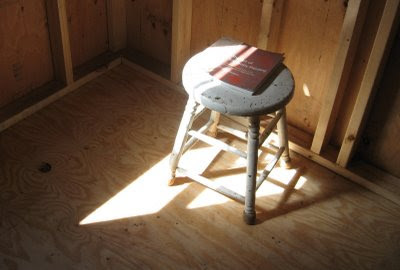 In the spirit of celebration, I'm proposing a roundup of pictures of where the book has been. 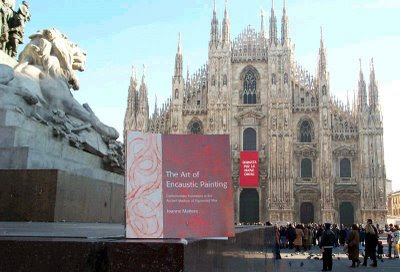 What inspired this project is a picture of the book in front of the Duomo in Milan (grazie, Andrea). If you've got a copy of the book and a digital camera, send me a J-peg of where your book is or has been. 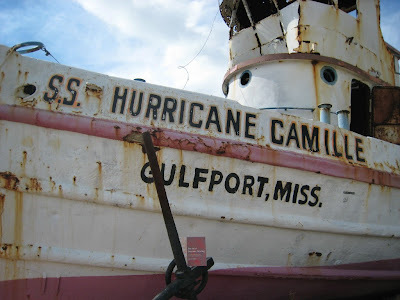 Michelle Allee sent this picture (and the one at the top of the post) from Pass Christian, Mississippi: "I'm writing from the Gulf Coast. 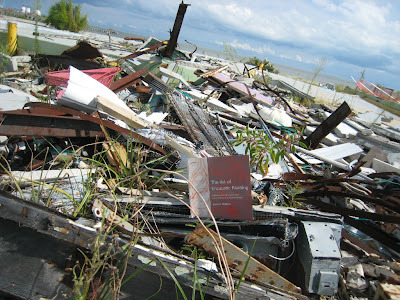 We were hit by Katrina 2 years ago, and although we still have a long way to go, removing debris, rebuilding, and recovering, we have come a long way as well. Our art association in Hancock County sent out your wonderful article on donating to auctions, which led me to your blog site. 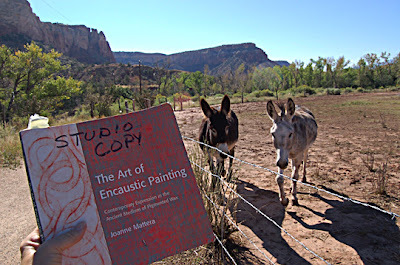 My personal copy of The Art of Encaustic Painting was unharmed in the storm but I couldn't resist the photo opportunity to let you know that the artists here are alive and well." Glad to hear it, Michelle. And thanks for the picture. These pictures are from Paula Roland in Georgia O'Keeffe country. 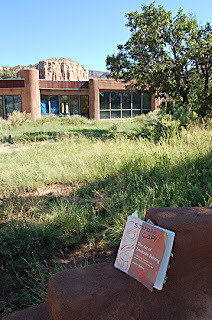 Her note said in part: "I just returned from teaching my Encaustic Monotype and Painting workshops at Ghost Ranch. I have two copies of the book. I keep a "clean" copy at home . . . 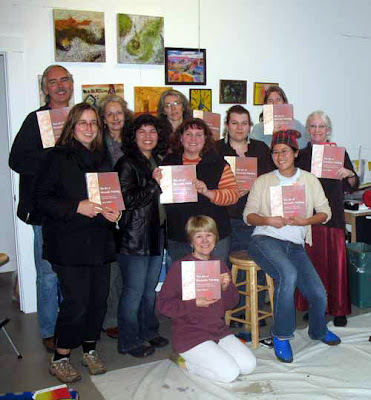 The other is a studio copy so participants and I can use it for reference (note the many page markers!). 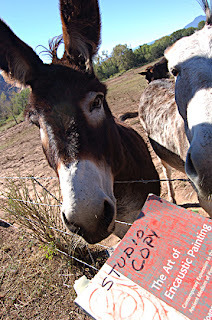 "I'm sending you three pictures taken outside of the studio, with our friends the pack mules. There is a narrative here, somewhere." 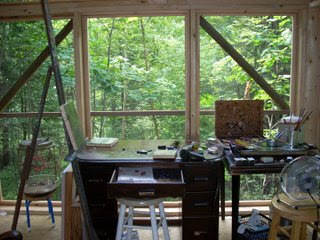 In Camille Davidson's Maine studio in the woods. When Camille opened her desk drawer above, she found that a mouse had turned the cover . . . into a nest! Identify location and photographer. No large files, just reduced-for-sending J-pegs. If you have an interesting anecdote to go with the picture, send it to me along with the J-pegs: joanne@joannemattera.com. I'll post my favorites.Oh, and there's a prize: The owner of the most beat-up book will get a new copy. I'll keep updating this post until the end of the year, and I'll award the prize then.